Jelly Nails Are The Latest Manicure On The Block, Will You Take Them For A Spin? Jelly nails are pretty hot up there in your summer nail trends for the year. We've seen the pastels, the bolds and even the nudes, now it's time for clear nails. Think about those jelly shoes you pick up during the monsoon or those clear, jelly, PVC bags you buy for a day at the beach. Yep, that's exactly what this new trend is all about. Clear, see-through PVC kinda nails. So if you're heading out to the beach and want to match your mani to your bag or your jelly shoes, go ask your closest salon for this hot new gel manicure. You can get them in any colour you fancy, there's a whole lotta inspiration to choose from! While I'm not sure how I really feel about having see-through nails, some of the jelly nail designs we found on Instagram are pretty cute. 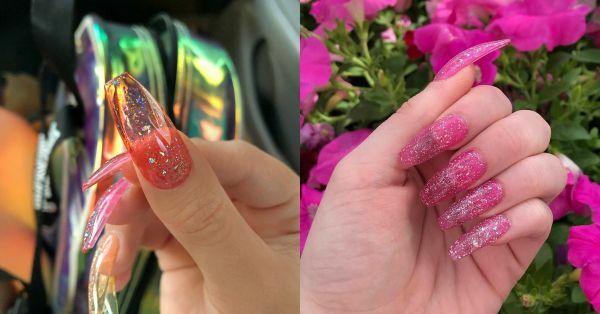 From glitter nails to embellished nails, bright popping colours to a jelly-style French manicure - this hot new trend is going to have you hooked. I have to admit, I'm intrigued and I can't seem to stop looking for #jellynails on Instagram. Bright and summery, but of course. Or maybe you'd like something a little more cut-throat? Literally! What do you think? Will you give this new summer nail trend a spin?